With the festive season nearing, there's a high impact on various auto companies which are gearing to revamp their sales structure in the Indian market. One amongst these companies is Honda Cars India Ltd (HCIL), which has introduced an 'Exclusive' Edition of its flagship hatch Honda Brio in the market. 'Edition' tag is enough to say that Brio now exhibits better interiors and additional accessories to double Honda's customer base. The Brio Exclusive Edition has been launched on the occasion of the second anniversary of this particular car in the market. As far as pricing is concerned, this model has shown up with a price tag of Rs. 4.92 lakh (ex-showroom, Delhi) , and is available in three vibrant colors- Alabaster Silver, Rally Red and Taffeta White. This model houses sporty black interior theme and premium quality upholstery to attract the viewers. The striking interiors also comprises of perfectly suited Instrument Panel, Roof Lining and Interior Trims. There is even a new tailgate Spoiler added, which further pumps up the aesthetic feel of the car. Companies attempt to provide freshness to this hatch seems to be a good move to sustain in the market. Honda didn't preferred to bring large changes to the exteriors of this hatch, and so brought maximum of it to the interiors of this car. Company retains the compact structure of hatch, while also went for minute changes on the outsides. The Exclusive Edition model receives door visor, Exhaust Pipe Finisher and illuminated side-step Garnish. To make it look more distinguishable, this model has also received an 'Exclusive' emblem. The characteristic feature of this hatch is its rear potion, and now combined with such beautiful interior cabin makes this car complete. This new edition model of Brio is available in three vibrant colors- Rally Red, Taffeta White and Alabaster Silver. All colors decided keeping in view the choices of today's youth. Lets see what level excitement this new model reaches in the Indian market. Company has put all its efforts to give this hatch a makeover and make it look more youthful. And in this race has delivered a car with Sporty Black interiors, more vibrant and cheerful hatchback model, which targets the young audience with this. It has got a brand new tailgate spoiler, which simply works to enhance the sporty look of the car. While entering this new car, the premium quality upholstery in pure black color catches maximum attention. Rest features added to the insides include, instrument panel which perfectly blends with the rest interiors, Roof Lining and Interior Trims. Overall, company assures to deliver Brio with improved interior structure that is now designed to gather more sales. The 'Exclusive' Edition model of Brio is powered with the same 1.2-liter, SOHC, i-VTEC petrol engine , which is capable to generate maximum power output of 86.8bhp @ 6000rpm and peak torque measures at 109Nm @ 4500rpm. The engine comes mated with 5 speed manual transmission which ensures engine performance well suited for the Indian roads. This city car performs well due to high torque generated at low rpm. The i-VTEC (Intelligent Variable Timing and Electronic Lift Control) engine ensures high power output as well as makes this car fuel efficient. Such peak performance loaded with numerous features into it, definitely makes this hatch a stand out. The vehicle competes with its like of Toyota Etios Liva, Ford Figo and segment leading Maruti Suzuki Swift, so Honda has to provide class-leading safety features with its Brio model. As far as braking system is concerned, the front wheel gets ventilated Front Disc , while the rear wheels get drum brake s. This combination of brakes is certainly efficient enough, and proves itself well even in case of sudden brakes on slippery roads. Apart from this, Honda also provides ABS with EBD to enhance the handling and control of this car. There is McPherson Strut suspension type at the front and Torsion Beam Axle type suspension at the rear, and this combination ensures an effortless ride with Honda Brio. The four door hatch is manufactured to give a comfort ride for five passengers. In fact, the boot space and interior comfort level makes this hatch stand as class-apart in the segment. 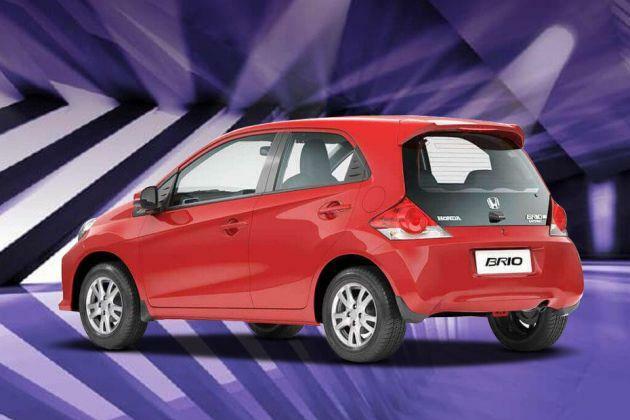 Despite having a compact structure, Brio features spacious design and all credit goes to the aptly decided wheelbase of it. There's an electric power steering for smooth handling as well as air conditioner with heater comes as standard in all models. In addition, there are cup holders for the convenience of the passengers and electrically adjustable ORVM. The steering comes with tilt feature that allows to adjust it as per the need of the driver. When it comes to the safety features, Honda keeps it upto the mark and believes in giving complete protection to Brio's customers. This hatch is equipped with two front airbags and driver side also has an Intelligent SRS (i-SRS). Apart from this, as mentioned before, Brio sports ABS with EBD and Brake Assist feature to it. This model is based on G-CON technology , which is crash resistant and also comes with crumple zones which ensures safety of pedestrian. Seat belts are also of pretensioner type, which keeps the body intact in case of mishappenings. Pros : Compact size, best-in-class interiors. Cons : Available only in petrol option.